How in the world can using a hand mower help me build my business? Power up! Pushing a hand mower is very different from pushing a power mower. A power mower is started, mows through the grass, and you’re done. A hand mower takes more muscle and sweat to run, so you want to stay in tip-top condition. Stay hydrated, rest when necessary. The business lesson: Embrace hard work. Get started and pace yourself so you don’t grow too quickly, don’t tire easily and don’t stagnate. Keep yourself physically strong, mentally sharpened and conditioned to run your business. Remember to eat well, exercise and rest. The better care you give to yourself, the better care you give your business. Stay sharp! Pushing a dull-bladed hand mower through your grass is like trying to run a business without a business or marketing plan. You have to sharpen the blades of the mower every so often to make sure it can cut the grass effectively. The business lesson: Your business and marketing plans are the blades of your business. Sharpen these blades often. For a business plan, revisit each year before the end of your fiscal or calendar year and ensure you’re following your road map. For a marketing plan, revising every 3 or 4 months to make sure your goals and objectives are on track with your road map. If not, make strategic adjustments either to your objectives, or the goals themselves. Strategize! It is possible to just go out and cut the grass. A better approach would be to figure out where the tallest, thickest grass is and how to divide the yard so you can see measurable progress. The business lesson: Find out where your target market can best be found vs. the “low hanging fruit” you can easily get, and plan how you would divide not just your marketing/sales activities, but also your marketing/sales tools to make the best approach with measurable progress. Go over each area often! Sometimes the grass is too thick for just a pass or two. In order to get a good cut, you have to go over each area often. The business lesson: Visit each target market more than once and review the follow-up process and product or service offered at that time. They may have passed on your offering before due to a number of reasons: timing was not right, not in budget, not aware of a problem/issue, etc.. Ask each prospect if they would like to subscribe to an email notice about sales and new products or services, and ask how frequently they would like to see the notices. Don’t spin your wheels! 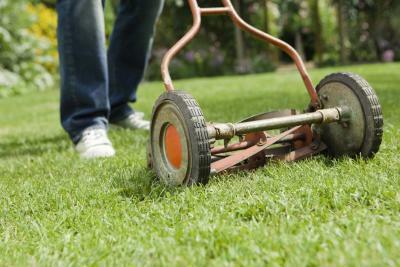 With a hand mower, you can cut taller, stubborn grass by passing the mower quickly, then stopping abruptly so the blade wheel spins for a bit. The business lesson: Spinning the wheel might work for the hand mower, but it is nearly the same as beating your head against the brick wall to see if it moves. Remember: marketing is a process; it can be an instant attraction but not an instant reaction. Think of a way to reintroduce a common approach in your industry with a different phrase. Try a different marketing tool or a different time of the year. If something in your marketing or sales plan is not working, re-evaluate each quarter and stop using what’s not working. Ask for help! You can mow a yard with a hand mower all by yourself, but at the end of the day you will be exhausted. Ask a family member or friend to lend a hand. The business lesson: It’s okay to ask for help! Hire out your weaknesses so you can stay focused on your strengths. Ask your current and former clients for referrals. Brainstorm with a trusted mentor family member, partner, or colleague on new ideas to keep your business ahead of the competition. Evaluate your business plan with an advisor to help you stay on task. Defer to a local print shop or your graphic designer on suggestions for design layouts, types and thicknesses of paper stock and coatings.